The last thing to do before reaching work was walking the length of the sidewalk from KPMG, the underpass near PBCom, until our office building. What I hated most about this was, in spite of the heavy breathing from rushing, I usually had to endure two bouts of ‘Marlboro Country’ or a group of smokers having their nicotine fix. But recently, I have noticed this interesting signage affixed in front of SMART Building. It was very clever and diplomatically-worded, not to mention that the smoking skull illustration was very apt. I laud the building administration for putting up such a reminder. Now, I only have to endure the group of smokers in front of PBCom. 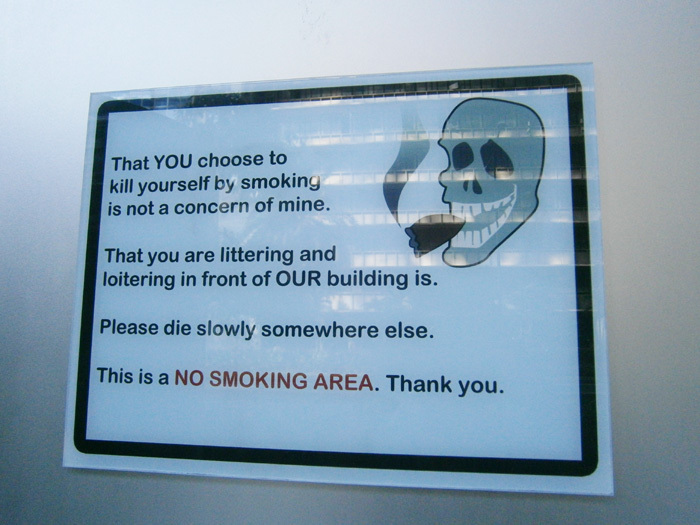 Interestingly, that building also has something posted in their building and even has the city ordinance number reminding people that smoking was prohibited. But alas! It fell on blind eyes and was blatantly ignored. There’s nothing much I can do about it but cover my face just to prevent myself from inhaling second-hand smoke. Ugh. 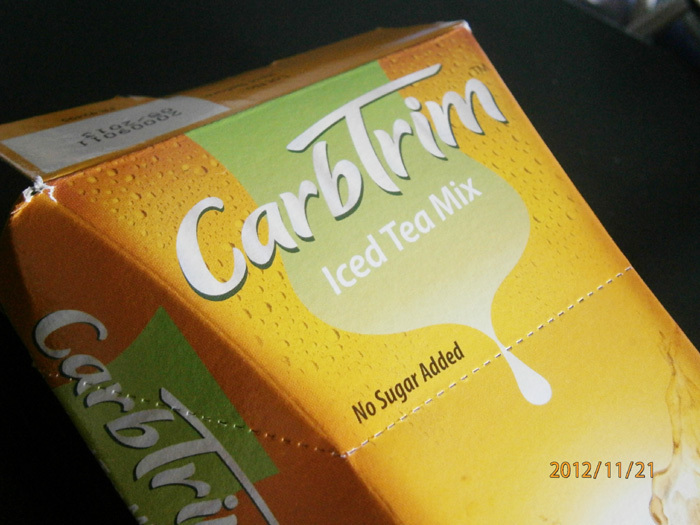 On another health-conscious note, I have decided to give this new product a try – CarbTrim. I’ve seen its commercial (featuring Angelica Panganiban) and I was curious to give the product a try. Now, let me begin by saying that I began exercising again two weeks ago after a long hiatus. I’ve been very eager to get on my stationary bike again. But as there were people working on the construction of the rooftop of our house’s extension, I thought that it was very insensitive of me to exercise comfortably in my bike while watching videos, while they go up and down bringing construction materials and concrete. It did not sit well with me. As I can no longer wait for the long construction initiative to finish, I decided to just be ready and wait for them to go during lunchtime to have just an hour of exercising. I have to squeeze everything in an hour, though I know I can push myself to 30-minutes more. So for CarbTrim, their tag line “Stop watching carbs, start blocking them!” pulled me in badly. 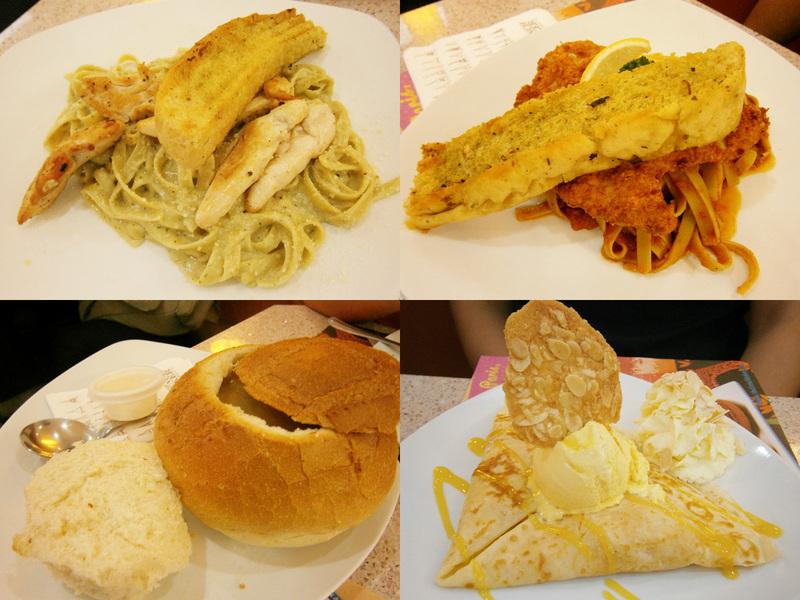 Whenever I try to go on diet, the carbs are always the first to suffer. I know that it’s not exactly good but I can’t keep the idea of ‘carbs will make you fat’ our of my head. I knew that it was false but I still believed it anyway. CarbTrim was purported to contain the carb-blocking ingredient Phase-2 white kidney bean and was ‘clinically-proven’ to help blocking carbs. Now, I’ve only just finished the whole box (containing six sachets, I think). I drink just a sachet during the first meal of the day (usually a brunch), then after resting for more than 30 minutes, I usually head right away to my bike. What I’ve noticed was that during the rest of the day, I began to eat less than I would normally eat. I don’t exactly know if it was psychological because I have a tendency to extremely restrict my eating when I’m dieting. The tricky part was that I already ditched the weighing scale as weight loss was no longer my ultimate goal. I still want to fit better into my clothes but I no longer want to be stick-thin.The upcoming winter on our December trip will surely send me crawling if I were emaciated. I’m just trying to build my resistance because I also do not want to end up with a botched vacation, like what happened last September. As I’ve already finished drinking all of the sachets, I will be buying another box later just to continually observe its effects. At the back of my mind, I knew that it might not be working as it was purported to be. However, I’m still going to continue for the heck of it. Once the clock struck 12, I felt extremely happy because it was already the start of the -ber months. Here in the Philippines, it usually signals the start of the Holiday Season. And true to form, while we were waiting for our food to be served in “French Baker” in Ali Mall, the Odyssey kiosk nearby was already playing English and Filipino Christmas carols on repeat! Christmas is nearly upon us, and once All Saints is over, the Christmas fever will be on full-throttle.